Its getting pretty close to the end of the semester and, as usual, I feel like I’m spinning plates. I’ve been watching out of the corner of my eye as more blog posts pop up in my Twitter feed responding to the resignation of the editor and the entire editorial board of the Journal of Library Administration (THIS ONE is a good place to start and there is some great information HERE). While I risk having a couple dozen plates crash all around me, I want to take a minute to applaud Damon Jaggars and the now former editorial board of JLA for taking such a brave stand for Open Access. I also want share what the whole experience has made me think about. As an Open Access advocate, I probably would have watched this story anyway but I feel a special connection to it as I co-authored an article in the January Issue of the JLA with Micah Vandegrift. Micah was absolutely tenacious about getting a better author agreement out of Taylor and Francis and, if you haven’t done so already, you should read THE BLOG HE WROTE ABOUT THAT EXPERIENCE. The most interesting part of that story for me was the creation of what Micah called the alternative table of contents. As each author was allowed to deposit a copy of their article in an open access repository, Micah was able to construct a table of contents that linked users to freely available copies of the articles creating, in effect, a totally free digital version of the issue. It seemed like an afterthought at the time but now it strikes me as a model for the way we might want to do things moving forward. Essentially what happened was authors contributed content as a professional responsibility, professional networks organized and critiqued that content and libraries made that content freely accessible to the public. This is a real-life example for me of how scholars/authors, OA journals and libraries can use digital publishing tools to work together to make information freely available without traditional publishers. 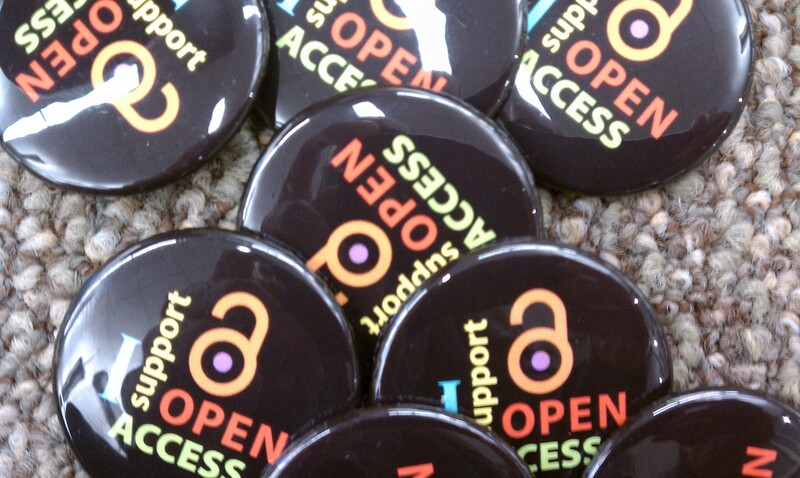 But while this is a really exciting moment for the Open Access movement, I think it is also a good time to consider a few challenges that we are going to have to deal with if we really want to see the open access movement present a truly viable alternative to the current system of scholarly communication. First, most libraries will need more support if they are going to be publishers of digital content in a sustainable fashion. It is not the case that publishing can simply be pushed into a library and be expected to continue on as usual except for free. If the operation is to be sustainable and scalable, the library-turned-publisher will need hardware, infrastructure and people. However, it is equally crucial that libraries receive intellectual support from their parent institutions. Some libraries already house academic presses and others are experimenting with what is, in effect, academic publishing. Unfortunately, it often feels like the conversation about how to do this is happening mainly between libraries and library organizations. We are going to need support from all over campus and throughout academia in order to do this right. Second, academic networks and employers of academics (and alt-academics) will need to find ways to support (and compensate) increased responsibility for scholarly communication. Publishers currently provide important bureaucratic and vetting functions for scholarship and I don’t see the need for these things totally going away. Micah and I had a truly amazing experience working with Barbara Rockenbach who served as the guest editor for the January issue of JLA. That is precisely the kind of work that we will all be doing more often if we can successfully open up and decentralize scholarly communication. I point to Press Forward as a really cool example of how an alternative system could play out. That being said, Press Forward requires plenty of intellectual labor as well. If this work is part of our professional responsibility – and I think it is – then we need to make sure it is officially part of our jobs. Phrases like “disruptive technology” and “game changer” have become common if uncomfortable parts of my professional vocabulary in the past couple of years. In my role as digital scholarship coordinator, I am constantly trying to look down the road and imagine what both the technological and the academic landscapes will look like in 5, 10, 20 years. As a result, I am well aware of the necessity of visionary thinking to insure that all the moving parts work together to encourage truly revolutionary work and support the scholarly mission of the University. At the same time, I am also all too familiar with the paralysis that can set in if you wait to make sure everything is lined up or second guess every little piece of the puzzle because so much is at stake. Is a project sustainable? Is it strategic? These are important questions but they can be difficult (or impossible) to answer in a constantly changing and unstable academic environment. Focusing on the long-game is important but it can be really unsatisfying. If everything you are doing is going to take years to pay-off, maintaining motivation will be a real challenge. In the past year – which has definitely been full of long-range, strategic planning for me – I have been consistently re-inspired by small-scale projects that come into the world with little-to-no funding and minimal scheduling. They are a reminder that so much of this disruptive technology is actually relatively easy to use and that changing the game does not always require a grant, a task-force and a Service Level Agreement. For example, DiSC started fall semester off with the Tweeting #OWS project. In October of 2011, our sorely missed manager of software development, Scott Turnbull (@streamweaver), wrote a script to harvest tweets related to the Occupy Wall Street movement. Because he knew what he was doing, this was not a huge investment in time for him and he had something up and running in a day or two. About a year later, I challenged the DiSC graduate Fellows (Sarita Alami, Moya Bailey and Katie Rawson) to work with Jay Varner, Digital Scholarship Solutions Analyst, “do something” with the harvest in time for the one year anniversary of the beginning of the movement. They had no money, a little server space and about two weeks to make something happen. They did, and it was amazing. Using free tools and their own savvy, they produced some really impressive maps and charts. Furthermore, we all had a really valuable experience working as a team. Another example of a small project from last semester is the Atlanta Map website. DiSC is currently working on a very ambitious project to build a geocoder for an historic map of Atlanta. Eventually, this tool will allow us to create something like a Google Map of historic Atlanta and will let us visually represent the demographic and social information both spatially and temporally. This is an ongoing project that will take years. In the meantime, we were able to place the maps online to let people start playing with them. Even without the geocoder’s functionality we are working on, the images are already generating interest in what we are doing. In the coming year, I am really looking forward to seeing some major projects and initiatives come into being. I am also genuinely excited by the scale and ambition of the strategic planning Emory is undertaking and am honored to be a part of those conversations. Amidst these dramatic and complex maneuvers, I am also committed to making room for small projects. They get people excited, spark their imaginations and let us balance the planing with a little building too. Do you have a favorite small project? Tell me about it in the comments. The following is an abridged version of the paper I presented a few months ago at the Georgia Council of Media Organizations meeting in Macon (I added some of the pictures from my slide show). It is based on a presentation that I developed with Erica Bruchko, Emory’s Humanities Librarian, and Charles Forrest, the director of Library Facilities at Emory. The full title of the paper was Emory University’s Research Commons: Connecting scholars with technology, expertise and each other in the library, but that does not look very good as a title for a blog. Fun fact: I was born in Macon but moved when I was three. The hospital where I was born was across the parking lot from my hotel and I could see it from my room. This was disturbing to me in an unexpected way. The digital humanities has been enjoying significant buzz in recent years. Digital Humanities centers, such as the Roy Rosenzweig Center for History and New Media at George Mason University and the Scholars’ Lab at the University of Virginia have been producing original and innovative tools and resources for scholars. Organizations like the Association for Computers in the Humanities have coordinated conferences (and un-conferences) and the Chronicle of Higher Education has devoted dozens hundreds of articles and one regular blog (Prof Hacker) to issues related to technology in the academy. This is to say nothing of all the digital projects such as Voyages: The Transatlantic Slave Trade Database and Visualizing Emancipation that take advantage of emerging technology. Starting at the end of 2010, the excitement slipped out of the academy when the New York Times began a six part series on digital humanities, the Humanities 2.0 series, which covered such topics as digital maps, text analysis and researching with large set of digital data. Then in January of 2012, two of the largest and most traditional academic conferences in the humanities featured record numbers of panels devoted to digital topics. The American Historical Association’s annual meeting had 24 panels and the Modern Language Association had a total of 57. At Emory, scholars in and out of the library have been inspired and challenged by the rising popularity of digital scholarship. Scholars who want to incorporate technology into their work – or at least want to find out more about what technology can do for them – are often unsure who to turn to for help as the tools and methods of digital scholarship are still new ideas in many departments. Another challenge for scholars is the fact that, like many universities, Emory lacks spaces dedicated to graduate students and faculty in the humanities who want to work collaboratively on advanced research. Though there may be some activity in one department, academic politics are notoriously prickly around issues of territory so finding truly neutral turf for interdisciplinary work has often been a challenge. Another challenge that is related to this lack of collaborative space is the lack of community that leads scholars to think no one else is interested in digital work. For the library, the rise of digital scholarship is part of a more overarching challenge of moving toward an engagement-centered mission rather than a collection-centered mission. Specifically, it has highlighted the need for a comprehensive approach to supporting digital work. While the library has always been a place where scholars go for help working on their projects, these partnerships have generally been ad hoc in nature, and uncoordinated across the institution. The lack of established procedures has resulted in occasionally frustrating experiences and the projects themselves have suffered as a result. These challenges are not unique to Emory. In the summer of 2010, four librarians at Emory created an ARL SPEC Kit (326) which focused on how libraries support digital humanities. The primary finding was that, of those ARL member libraries that support digital humanities work at all, that support was generally defined on a case by case basis and there are very few examples of spaces, policies, and procedures developed to support digital humanities. This lack of coordination means that work is often unnecessarily repeated and critical questions (such as those related to copyright, metadata and framework) are often left unaddressed until significant amounts of time and money have already been spent. In order to begin addressing these challenges, Emory has established The Research Commons in the Robert W. Woodruff Library. Located in a prominent space on the third floor, the Research Commons functions as an open workspace designed with graduate students and faculty in mind. Additionally, the space serves as a public-facing front door to a wide variety of resources and services located in the library. From its location inside the library, the Research Commons is a truly neutral space where groups of interdisciplinary scholars can meet and work collaboratively. In fact, while the digital humanities play an important role in the library’s thinking about the Research Commons, the space itself is completely and proudly interdisciplinary. In the first year, we have been excited to see graduate students from the medical school and the MBA program make creative use of the space. 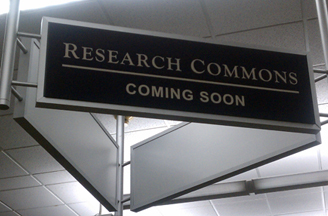 As Charles Forrest recounts in his COMO White Paper “Information, Learning, Research: Evolution of the Academic Library Commons” the Research Commons is the latest iteration in a series of experiments in library space. Beginning in the 1980s when research library users started demanding digital resources like CD-ROMs and personal computers some institutions began designing spaces they called “Information Commons.” By establishing these spaces, libraries highlighted their role as learning spaces and not just storehouses for books and periodicals; they were spaces where researchers could find and use all of the tools they needed to produce work. Following along this trajectory, Emory’s Woodruff Library opened the Learning Commons in the 1990s. This stage in the evolution of the space is defined by desktop computers with specialized software and individual study carrels but also by a cafe on the ground floor. With the learning commons, the library focused on individual scholars and their needs defined broadly. With constantly expanding online resources and a growing percentage of researchers working with laptop and tablet computers, the library continues to move from a collections based mission to a mission that focuses more on user engagement. With online resources diminishing the differences between libraries (and even the differences between the library and other spaces like homes and coffee shops) the library is focusing on what it can uniquely offer users: space to work collaboratively and expert advice. The Research Commons was conceived of and designed with these strengths in mind. The space is completely open and almost all of the furniture is mobile, enabling users to configure the work areas to suit their needs. This open design also allows scholars to see what other scholars are doing and to be inspired by what they see. These unplanned and serendipitous encounters, along with more formal events, allow the Research Commons to establish and nurture an interdisciplinary community of scholars interested in digital scholarship. These concepts of serendipity, experimentation and evolution have been central to the design process. For example, original plans for the space included several small office spaces forming a spine down the center of the Research Commons. This idea was abandoned because we simply did not know if users would want these kinds of spaces. Instead, we left the area as open and flexible as possible and have spent the past year watching people use it. When we noticed that people were using large marker boards as mobile dividers to define their space, we got more of them. Currently, the only permanent resident of the Research Commons is the Digital Scholarship Commons (DiSC); a Mellon Foundation funded initiative to facilitate experimental, collaborative work that takes advantage of emerging technology. Emory’s Library has a long history of partnering with faculty who use emerging technology in their research, but the recent increase of interest in such projects demanded proactive action to coordinate demand and capacity. From its position in the library, DiSC facilitates a direct connection between scholars and unique collections such as those held in the Manuscript, Archives, and Rare Book Library (MARBL). In partnership with librarians, DiSC recommends tools and processes that minimize redundancies and prepare for long-term maintenance and preservation. DiSC also aims to inspire the Emory community through events, training and projects. In its first year, DiSC hosted three postdoctoral fellows, three graduate student fellows, three guest speakers, a year-long workshop series, and a symposium on technology and disabilities. Furthermore, it provided expertise and funding for four teams of faculty, students and librarians who were working on digital projects. I’ve started and stopped this post numerous times since Emory announced its decision to suspend the Institute of the Liberal Arts. Ultimately, I’ve decided that it would be cynical of me to be silent about this. The ILA has given me so many amazing opportunities over the past ten years. I graduated from the ILA in 2010 and I continue to work closely with students and faculty there. Professionally and personally, I am a part of the ILA and, speaking for myself, I am heartbroken that it has been suspended. Heartbroken but not cynical. Well, not cynical enough to just shrug my shoulders and keep my mouth shut. We are in a relationship, me and Emory, and I’m not ready to give up on that. I’ve written and erased dozens of paragraphs about what I think happened. I wrote them because its important to get that straight if we are to offer useful alternatives. I erased them because I just don’t know what happened. I DO know that big decisions were made and the explanations are, to put it diplomatically, not satisfying. I also know that no one seems to have good answers for the students who will be directly and negatively impacted. I know some of the people who made these decisions and they are smart, thoughtful professionals who are committed to the success of all students. So, I can only conclude that there are parts of the story they can’t tell us. As a result my trust is being severely tested right now. However, I am committed to working through this for my own sake and for the sake of all my friends in the ILA. We all have a serious stake in Emory’s continued eminence and in how it achieves that. So we need to figure out how to move forward. The current ILA students have already set out a list of questions for the administration and those need to be answered immediately. I am particularly eager to hear how those students who decide to stay at Emory will be supported as they encounter new and unanticipated requirements. Along with reimagining the ILA, I hope that other departments are also encouraged to reimagine what they do, how they do it and with whom they do it. I hope that an investment in “the traditional strengths of the arts and sciences at Emory” is not understood as a simple investment in tradition. I would like to see new traditions such as collaboration and social engagement flourish along with older traditions of critical thinking and methodical investigation. Traditions like snobbery and isolationism should be reimagined as barriers to eminence. This past week has been hard but oddly inspiring. I have spent some quality time with ILA students; some I’ve known for years, some I’ve only just met. They are incredible people with amazing talents and I have been blown away by how positive and proactive they are in the face of hard and confusing news. Their solidarity with each other is humbling and their loyalty to their faculty is touching. We cannot squander this potential. If we value interdisciplinary scholarship and our goal is eminence, these are the people we need. I hope we can all figure out how to continue working together. If there is anything I can do, let me know. This post is a response to Peter Burian’s excellent piece for Inside Higher Ed late last month titled Defending the humanities. It reminded me of a theme that has run through several conversations about digital scholarship and tenure and promotion. My colleague and friend Moya Bailey, in her post reflecting on her first THATCamp CHNM, ponders over the question “if we love doing the work does it matter if it doesn’t count?” As she notes, your answer to that question may vary depending on where you are in your career. While it is true that faith and idealism has served the humanities well, we need to look at our world with clear eyes and engage with it rather than pretend like we can set ourselves apart from it. I graduated from college in 1998 with a degree in American Literature and the economy was relatively awesome. Like most of my classmates, I was operating under the assumption that a college degree in something you are passionate about was pretty much all you really needed. I admit that the details were a little fuzzy back then but I had faith that it would work out. There seemed to be ample scholarship money for grad school and new job opportunities in the booming tech sector. I wasn’t in a hurry so I spent a year teaching English in Poland just because it sounded fun. Had I started college sometime in the last four (maybe eight) years, I don’t know if I would have had the stomach to keep the faith. I knew I wasn’t going to get rich with my English degree but I didn’t really think I would be homeless either. That fear would come later when, having extended my stay in grad school as long as possible, I scheduled my graduation from a doctoral program in American Studies for May of 2010. The bad economy means fewer jobs; not just traditional tenure track jobs – which have been scarce for a long time – but jobs in general. The jobs that do exist seem pretty specific and employers can afford to be picky. At the same time, college is getting more expensive which is resulting in astonishing levels of student loan debt. I know that it is crass to talk about vulgar things like debt, unemployment and wages in the context of a noble humanities education but these are real issues that are impacting our students (both undergrads and grads) as well as our friends and colleagues. Those of us who are working in the humanities have to acknowledge that our careers are not only the result of our incorruptible souls and strong characters; they are also a privilege and, due to shifting social and economic conditions, an increasingly rare one at that. So, while I agree with all the points Burian makes in his essay, I would argue that in order to really defend the humanities we need to identify concrete ways to demonstrate the continued relevance of the skills and methods learned in humanities courses. Furthermore, we need to take stock of the world as it currently exists around us and identify how the humanities can creatively and critically engage with it. I love that it is the humanities’ instinct to slow down, be careful and see the beauty and value in places where no one else is looking. At the same time, I worry about our propensity to demonize the practical and fetishize the esoteric to the point that we alienate others (for more thoughtful notes on this, see Kathleen Fitzpatrick’s post on unpopularity and literary criticism). Those of us who have already devoted ourselves to the humanities understand why it matters in a way that feels instinctual but to make the argument we are going to have to think creatively and try to understand the world from the perspective of today’s students. Failure to engage them is not an option for obvious reasons. Here are three points to get something started. This list is not exhaustive and there is nothing terribly new on it. Many people have more experience than I in actually implementing these ideas and maybe some of them will read this and add comments below. I’m corralling these points here in response to this particular conversation. 1. Incorporate technology into course work and assignments. This is a no-brainer. Students’ lives happen online so why would they expect their education to be different. Furthermore, different tools may help you reach students with different learning styles and the more students (and graduates) out there who see the value of a humanities education, the better for all of us. Multimodal work also encourages media literacy. We are quick to point out how a humanities education teaches students essential writing and reading comprehension skills. Emerging (and already emerged) technology has provided us with new ways to communicate and new ways to learn and they each require their own kinds of literacy. We should embrace the opportunity to teach them rather than pretend like they don’t count. See Sharon Leon’s recent post on tech skills for historians which could be applicable to most humanities scholars. Also, everyone needs to keep an eye on what the University of Virginia’s Scholars’ Lab is doing with the Praxis Program. 2. Seek out projects that embrace rather than set themselves apart from the contemporary world. Burian, a professor of Classical Studies, uses an example from Homer’s Iliad to illustrate the timelessness and power of great literature. This is undeniable. Powerful art has the ability to reflect back at us our world and our lives in revealing and fulfilling ways. Avoid creating the impression that such work is an artifact of a long lost era by incorporating contemporary work into lessons and drawing connections across epochs. May I suggest finding a place for William Gibson’s so-called Blue Ant Trilogy? You can also find ways to engage contemporary culture directly and turn those critical skills on the world you and your students live in everyday. Have you heard about Mills Kelly, the history professor at George Mason? He teaches a class called Lying About the Past? His students study historical hoaxes and then propagate their own on the internet as a way to learn how to be more savvy researchers. There are also scholars who study the underlying technical structure of the technology that has become such an intimate part of our world. Calling what they do critical code studies, these scholars look for the values inherent in the code that makes our machines work. If you haven’t done so already, you should go read Siva Vaihyanthan’s response to the return of the University of Virginia’s president Teresa Sullivan published in Slate. Titled, Why our Universities Are Supposed to be Terribly Inefficient, Vaihyanthan makes a personal and passionate defense of the Ivory Tower noting how the efficient and esoteric academic work is a necessary part of innovation and one which the private, for-profit sector does not always have patience for. The article cites medical advances (Case Western’s Polio vaccine) and technological breakthroughs (Stanford’s Google) as examples of slow, experimental academic work that eventually paid off in important ways. The contributions of the humanities may not be as clear-cut and dramatic but I would point to the decades of scholarship and advocacy done in fields like gender and sexuality studies which have played a part in advances like The Lilly Ledbetter Fair Pay Act of 2009 and the end of the don’t ask don’t tell in the military. The humanities should be proud of the roles they have played in these profound cultural conversations. We should also look for ways to engage more often and more directly. History provides a good model for this given the long tradition of public history in the form of museum work. In fact, the Roy Rosenzweig Center for History and New Media at George Mason University has produced several tools which can be used by humanities scholars to make their work more publicly accessible. Omeka provides an easy way for scholars to build websites based on images and Press Forward is experimenting with new ways of “collecting, screening, and drawing attention to” scholarly work done online so that it is both more accessible and more timely. This started as a comment to Micah Vandegrift’s amazing post “What is Digital Humanities and What’s it doing in the Library?” but it got too long … so now its a blog. While I take credit (or blame) for posting it, it is largely a compilation of ideas that came out of two different un-conference sessions on DH and libraries; one at the Digital Humanities Summer Institute at the University of Victoria and one at THATCamp CHNM at George Mason University; both in June of 2012 (it was a busy, awesome month). 1. Get out of the library and talk to people wherever you can. When I made a list of all the things librarians could do to support DH, most of it boiled down to communication. The stereotype of the librarian is not that of a social butterfly and faculty members are not known for their ease in social situations either. Someone has to break the ice so it might as well be you. Attend events put on by the departments and centers you work with. It will be particularly valuable to attend events where scholars present their work. Ask to be put on the agenda at faculty meetings to talk about what can do. See if there are councils or committees that might like to hear from you. 2. Stay up on what the Digital Humanities Community is talking about. 3. Make digital archives available. Most libraries are creating digital content in some form. Too often, it just sits on a server somewhere un-or-under-utilized. Establish a digitization strategy that gives priority to collections that are unique and particularly attractive to your users. Promote your digital collections to the point that only those faculty members who are conducting research under large rocks will be unaware of them. 4. Develop a project process. Chances are, your library has helped a scholar complete a project. It is also likely that there was not a formal process in place to help you do that. You know that you will be asked to do this again so take some time to think about all the questions that need to be asked and people who need to be consulted. Don’t make it so bureaucratic that you scare people off but you need something to start with. Will we need to digitize anything? How does that fit into our digitization strategy? Is there a list of technologies and techniques that the library can (or cannot) support? What happens to the project after you finish? 5. Decide what you can give up. Your job is changing. You are being asked to do new things. While librarians have a great history tackling new responsibilities they still have to deal with the constraints of the time/space continuum. Take a look how you spend your day and see what could change. Library managers and administrators should be well aware of the issues and are likely interested in new ideas about how to be more effective in the changing university.